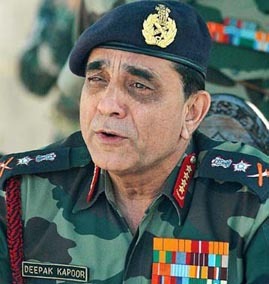 15 Jan : Army Chief General Deepak Kapoor has promised “due action” under the Army Act against four generals allegedly involved in the Darjeeling land scam but said dispensing of justice will not be swayed by external considerations like “personal biases” and “media pressure”. “We will take due action as per the rules in the Army Act,” he told a press conference on the eve of Army Day, referring to the subject suo motu in his opening remarks. 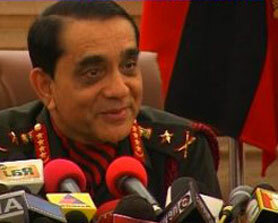 Maintaining that the defence forces are the only organisation that takes expeditious and judicious action once any irregularities are found, General Kapoor said it was his responsibilty to “dispense justice that is firstly fair, secondly just and based on facts of the case and thirdly it takes into account the culpability of the individuals involved”. General Kapoor said in the Sukna land case he has received inputs in the form of Court of Inquiry (COI) and recommendations of the Eastern Commander and the legal advise of the Adjutant General at the Army Headquarters. Four generals- Military Secretary Avadhesh Prakash, Lt Gen P K Rath, 11 Corps Commander Lt Gen Ramesh Halgali and Maj Gen P K Sen have been indicted by a COI for their role in allegedly issuing ‘No Obejction Certificate’ (NOC) to a private realtor.